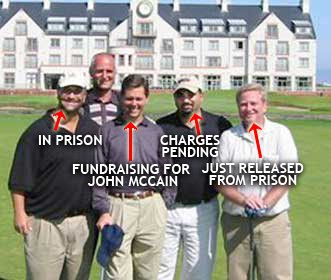 In the picture above, Jack Abramoff, Ralph Reed, David Safavian and former Congressman Bob Ney enjoy a leisurely golf outing in Scotland. Of the four individuals pictured, only one --Ralph Reed-- hasn't been to jail. This evening, Ralph Reed is participating in a fundraiser for John McCain.